The twenty-something Asian American student just said that he loved getting women’s perspectives from Salt-n-Pepa! Medusa just joined the circle, creating a little ripple of excitement and awe in the room…! I’m looking around the room, Actually, I already did the thing that most people of color do the first thing we walk into a room: I inventoried. How many (any?) folks of color? Any women? Any Asian Americans? This is a stunningly diverse gathering. There are African Americans, Latin@s, Asian Ams (3! ), Whites, and at least one self-identified Native American (Jeanette Bushnell). The ages range from @20 to @60. Women are in the majority. It’s been too long since I’ve been in this kind of a room. They’re still talking about awareness of hip hop’s history. One young woman just said she thinks this is something valuable that the academy can offer—memory, consciousness. But Olisa immediately warned how easily this can morph into arrogance, and the young woman agreed, offering an example of a professor who ignorantly described a L’il Wayne song as plagiarism, missing the deep meanings attached to sampling, quoting, homage, respect, and intertextuality. Great panel, with lots of thoughtful engagement! I’m already deep into my first workshop (more on that in my next post), but I’m thinking about how to offer something as a novice blogger. My perspective on everything I’m going to experience today comes from a complex of related ways-of-being-in-the-world. I’m a middle-aged, Asian American, multiethnic, straight, nerdy/academic, overly earnest, idealistic-but-eternally-dissatisfied woman. I believe in the power of performance to change the terms. I spend much of my time on a university campus where I’ve come to assume the right to free thinking and free speech but am frequently exhausted by the multitudinous ways that straight White masculinist conventions define my days. So… I love this unconference gathering already! This is great! Let’s see what happens today! Robin is a 2nd generation Korean American woman who graduated from the University of Washington with a degree in Ethnic Studies. Her work focuses in large part on youth programming, and she has worked as a teaching artist and a grass roots organizer with community college and LGBT students to help retain them in higher education and foster their successful completion of college. Robin also grew up in a household where arts were part of the daily fabric of her family with storytelling recognized as a crucial part of keeping and passing forward family history. The phrase “the personal is political” is one she works to break down. This is a large phrase that often gets thrown around. Robin asks, how far do we go in putting the phrase into practice and developing the capacity as a community to hold everyone’s stories as a truth? The seeds for some of her thinking towards this work began forming in Oakland, 2010, when Robin went to a Youth Town Hall. At this meeting, she consciously held back in sharing comments because she was an adult presence; she saw her role as one there to listen and learn. Present at the Town Hall were Youth Speaks, along with several other organizations. In the back of the hall were adults also there to listen to the youth. This meeting took place during the time of the Oscar Grant verdicts. Many of the youth engaged in heated discussions about community issues with a lot of creative responses and an expressed need for arts programming. A man jumped in and said, “This poetry and art is great, but what about the real activism?” The youth clearly wanted art as a vehicle for their work and an uncensored way to circulate their voices. As an active listener, Robin felt that for the youth art was their cause. From this experience, Robin discerned that when we tell our stories, it is important to also name our values. A revolution is value based, and storytelling plays a significant role in breaking us out of mechanizations. It helps us to develop the capacity to evolve. For Robin, storytelling is cultural presentation. It is cultural work that leads to healing. It’s a way to affirm, “I value myself enough to heal from trauma.” It is also about who has access to the microphone. There’s also the reaction to our stories; how people react to the stories being told shows where people are at. Are they accepting, defensive, or understanding? What happens when injustice strikes? Robin outlined some of the stages. You can name the injustice. There is the evaluation of the situation. You can go through a transformative process. It can also be ineffecitvely addressed with the behavior continuing. Or you can remain silent. Robin offered a case study of a radical local organizing community in which a male member punched his girlfriend. That’s an injustice that has occurrred. If we ignore it, we say the behavior is okay. There a range of impact: the man can leave, the woman can leave, the community gets rattled. Over time, things settle down with the history forgotten, the tension building back up, the cycle repeating. How we interact with our organizing communities can be very abusive. Robin pressed us to ask: How does the contradiction occur between an organization’s declared commitment to speaking out against social injustice and its allowing acts of injustice to occur within the organization? How do the principles contradict one another? How does a community fall short of the required work and not allow itself to move forward? She cites the example of a woman in an organizing community who began dating someone else in the organizing community. The woman was raped and violated by this male member. Notably, this was not the first time such an event had happened within the organizing community. So the question was, how could this be a cycle within the culture of the group? This forced the woman to engage in some deep soul searching because the organizing community had become part of the fabric of her life. Principles must be put into practice legitimately and honestly. Robin theorizes that people in organizations where such events occur can’t move forward because they can’t forgive themselves for having participated in social injustice. Forgiveness is crucial for the ultimate transformation of trauma and necessary to moving on. WORKSHOP EXERCISE: Participants were given paper and pen and asked to think about a situation when they saw an act of injustice and did not make an intervention. This doesn’t make us a bad person; rather, it shows how we become inculcated in focusing on individual survival. The goal with this exercise is to examine instances when we have seen an injustice occur and not taken action. In my own reflection, I think about the times I have seen mothers hit their children in public. I’ve wondered how this will impact their sense of self worth. For boy children, I’ve wondered what impact this will have on how they will feel about women when they grow up. For girl children, I’ve wondered what the impact will be on their own sense of mothering in the private and public spheres. For any child, what is the impact of being publicly violated, shamed, and forsaken by a parent? My impulse has been to speak out and ask the parent to remember their child is a small human being who needs their loving guidance. I’ve wanted to let the children know that what their parent has done is not right and does not mean the parent doesn’t love them. Why have I not made these interventions? Fear of further agitating the situation with the parent feeling judged and turning their violence against me or my further traumatizing the child. Robin’s point is for us to see how violence effects everyone, including those who witness it. A workshop participate shared example of how in her organizing work with a group there was a complaint made about the playing of sexist music that she did not join because of racism she also saw charging the exchange and didn’t have the wherewithall to speak out because of the complexity of the situation. Another participant mentioned how the issue of shame can also limit our speaking out. Robin pointed out the need for visionaries who focus on envisioning what we want more so than what we do not want. How then can we forgive ourselves? Our own forgiveness of ourselves shapes how we then can forgive others. In her own life, Robin has had issues with the police, but has worked to develop a sense of compassion for the police because they must participate in a system of oppression. If we want to fully realize the world the way we want it to be, free of social injustice, we then have to actively paint the world the way we want it to be; we must act in the world according to the way we want to be treated by others. WORKSHOP EXERCISE: Think about a time in which we have spoken out. How have we charted the next steps needed to move past a situation of injustice, shame, guilt, and resentment? In reflections about the workshop exercises, a participant spoke about the importance of recognizing presence. Remaining present in the scenario is crucial to coming into awareness. How can we develop the capacity to better others’ taking on the responsibilty for speaking out? Another participant asked, How do you think this concept can infiltrate more mainstream structures, in schools, etc? How do we institutionalize oral traditions? Robin’s response was that this work is becoming part of institutions, but what comes with institutions is all the trauma you inherit with those institutions. Robin’s high school programming emphasized the skill set of delivering knowledge through presentations. This made it easier for her to have the confidence to stand in front of a crowd and share her stories but to then also speak out about what those stories mean for her personally and as a mode of social transformation and countering injustice. The culture of protest is now becoming more accepted. It’s her hope that in art classes, as everyone sits as a table and draws they can talk about what they are drawing and why what they are drawing is significant to them. An audience participant then asked, How do you address matters of injustice among people who have good intentions and do not think they are engaging in oppressive and unjust behavior? Robins response begin with the example of Jeremy Lin as a case that illustrates intensions versus impact are two different things. She urged us to be clear that racism is not evil looking but deeply coded and ingrained. When she’s had such situations come up, she’s observed that people seldom have bad intentions; they just lack the tools to examine the impact. A participant added that there is a privilege in claiming the position of the well intended that only leads to defensiveness. Robin’s concluding remarks: We have to be able to name our itentions about our boundaries as well as our goals for the conversations according to where we are at with a situation. I found this workshop to be incredibly important and enlightening. I highly recommend considering Robin for presentation at your university, businesses, or other organization. Typically institutionalized forms of oppression go unaddressed because the culture lacks a vocabulary for frankly, clearly, and honestly recognizing social injustice and moving forward. There might be policy in place, but the language for personalized engagement is lacking. Here, Robin’s point that we have to forgive one another for how we have all been inculcated into institutionalized forms of oppression seems key. What changes might result if we can get past the hurt and defensiveness and frankly identify the wrongs that have taken place and the rights that have to be put into practice in order to move forward and create an organization that engages with social justice in theory not just in practice? Robin Suhyung Park can be contacted at: rsp@robinisalive.com; booking@robinisalive.com; and robinisalive.com. Robin Park is talking about storytelling in many different ways. How storytelling can lead to transformation. How storytelling is political. Right now the topic is what happens when injustice happens within your own community. Even if it’s named and analyzed it can be ineffectively addressed. Robin says that survivors in activist communities often wind up leaving. But if there is a cycle of abuse within a community, it will recur, just as in domestic violence. This is so practical and important. Says that what prevents organizing communities from putting principles into practice regarding abuse, is that they can’t forgive themselves. We have a writing exercise right now where we are supposed to writing about a time when we saw an injustice happen and didn’t do anything. I’ll write mine here. What I remember is being in a feminist organizing context, walking down the street, we are five women, three women of color, and I am one of two white women. We are walking in an unfamiliar city and we want to get to where we are going. We are excited to be together and walking quickly and talking. A group of men are watching us, and I remember feeling unnerved that they are looking at us. We walk quickly. As we pass, they say lewd things to the women of color. They ignore the white women, but their comments to the women of color are uncool. We all walk past them as a group, and when we get beyond them, the women of color walk together talking about what happened and I and the other white woman talk about other things. Why? We are just happy to get beyond the menacing men, and glad nothing happened. But for the women of color, something did happen, and what it was, in part, was my inability or unwillingness to deal with the racism of the encounter. I wished later I and the other woman who didn’t talk about it, had joined the conversation of the three women who talked about the racism of the encounter as we walked on to our destination. I remember feeling relieved that “nothing had happened” but even that reflex added to the violence of that experience. In relation to the story above, I forgave myself because one of the women who was harassed initiated that opportunity. She talked to me about how she felt and I apologized. I told her I recognized what had happened and I was sorry. I wonder what I would have done if she hadn’t done that? To move beyond, I want to learn from this experience to not wait until the person who was hurt speaks up. I knew it was wrong, but it felt to risky to say something. I didn’t want to make things awkward. But they already were. I’ll be ready next time, is what I told her. I want to be ready next time. Even if it doesn’t feel safe time to say something to the men as we pass, I will check in and say I saw that, are you okay? Speaking up is risky. But not speaking up is riskier. Washington Hall is vibrating with LOVE and not for the first time. Sitting on the floor, you can see scuffs that might have been made by people dancing to Count Basie, or standing still, transfixed by the vibrations of Billie Holiday’s voice, and we add our vibrations today in feet, Monica Rojas de Cajon Project right now just passed by. Workshops are starting! Coming up the stairs into the UnConference space, we are greeted by the Seattle Fandango Project in full swing, roquera activists, musicians, and theorists fully activating the audience! Michelle Habell-Pallan is there on the jarana with Sonnet Retman, the two lead conference organizers. Mil gracias! The conversation begins with a blessing by Christina Guiaocalling on the ancestors — spiritual and musical — Mahalia Jackson, Jimmy Hendrix, MLK, and all others who have blessed and graced the space of Seatlle’s Washington Hall. We call on the energy that lives in all of us; crying out for the healing and transformative love needed to take all of us onto higher ground with music bringing tremendous power and intention: all music and all sound reverberates throughout space long after the initial sound. Let us remember not just to be the sound, the action, but also the body that receives and carries forth these vibrations of love and healing to inspire and transform us. To seal this blessing, let us all say thank you three times together. Lara Davis and her crew ChiChi then took the stage and blasted sounds full throttle, drums, electric guitar, bass, creating a soundscape that permeated the entire body (the vibrations are buzzing into my fingertips as I type this now!). The sound is aggressive and commanding, the vocals weaving poetry, signaling the ying and yang. The second song references the punk aesthetic, the drums hammering a steady beat, the vocals screaming out and screaming out. Monica Rojas de Cajon Project is then up. The Cajon Project uses music, arts, and dance to educate about the cultural presence in Peru and its history of slavery, the goal to fight against racism and discrimination. Cajon is a drum that wasn’t used by women, who were not allowed to play the instrument, but is now the prime force for her own music and collaborations. They play their music today for the conference to begin the day by getting on its feet to dance. Monica begins to play out beats on the cajon, a box-shaped drum which is played by her sitting on it and hammering out beats on a box. (The sound and style reminds me of the street-style performance on found plastic containers.) The sound she creates is multi-layered and dynamic One of the Fandango Project members joins in and steps onto the stage adding her own rhythmn patterns, answering the invitation, freeing Monica to lead our dancing. Everyone is now on their feet; the hall is throbbing with the conference participants dancing together at 10 am on a Saturday morning! Vaya! And with that, there is a line dance out into the workshop sessions. Look for the next post on the first of the workshop sessions. Huh—when was the last time I sat 5 ft away from a rock band before 10 o’clock in the morning??? This is too good. 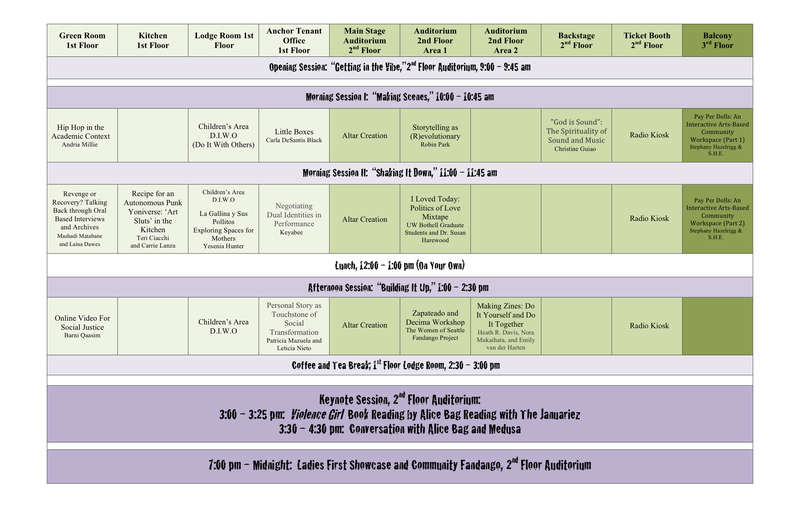 2012 UnConference Program Now Available! Check out UnConference and Film Festival program details today! All events take place @ Washington Hall 153 14th Avenue Seattle, Washington 98122. Events are free and open to the public. Click here to register for the 2012 UnConference: https://catalyst.uw.edu/webq/survey/mhabellp/144086. 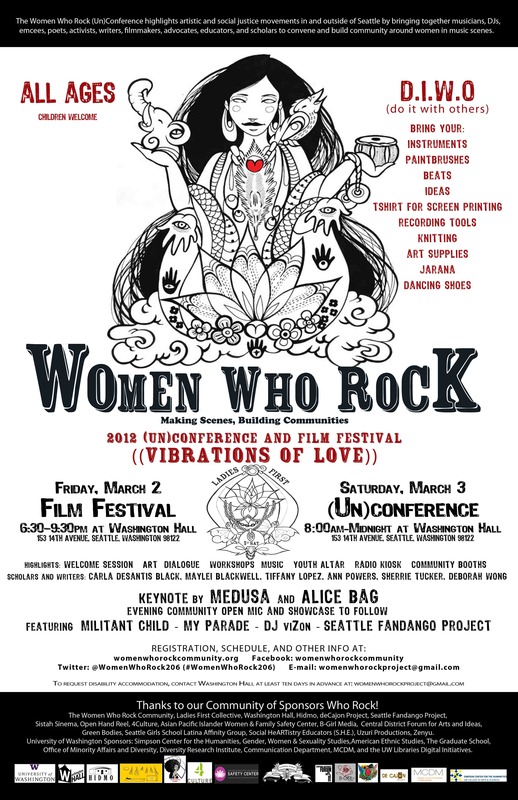 Register NOW for 2012 the Women Who Rock UnConference and Film Festival!